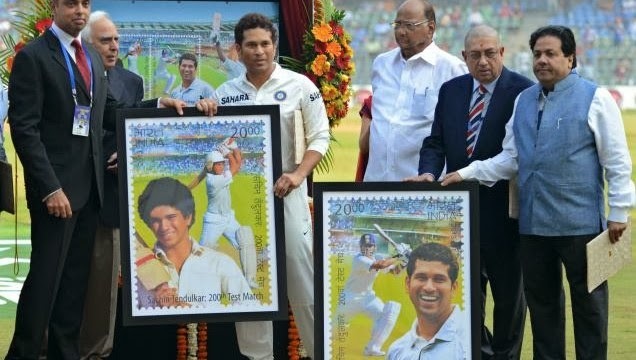 >> Union Law Minister Kapil Sibal released commemorative postage stamps to pay tribute to Sachin Tendulkar on 14 November 2013 (Thursday) at Wankhade Stadium, Mumbai before the start of 2nd Cricket Test match between India and West Indies. >> The 40-year old batting great is only the second person after Mother Teresa to have a stamp released after him, when he is alive. >> Union Minister for State for Communication and IT Milind Deora, Union Minister Sharad Pawar, BCCI President N.Srrenivasan and MP Rajeev Shukla were also present on the occasion of honouring the legend. 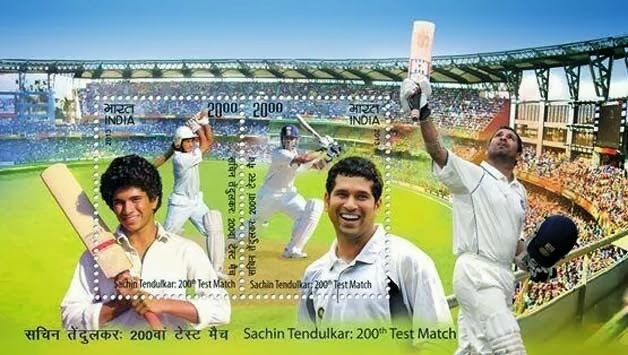 >> Designed in-house, India Post has 30.1 lakh sets of two stamps, 24.1 lakh sets of miniature sheets, and 16.1 lakh sheetlets of the stamp — all for Tendulkar’s fans.The stamp will be available at all major post offices. >> The day began with a series of tributes to Tendulkar - the BCCI president N Srinivasan handed him a memento, a painted portrait was presented to him, the West Indies side gave him a framed autographed shirt, the coin at the toss was specially minted in his likeness - and ended with fans euphoric over having watched him bat one more time. >> The Indian skipper Mahendra Singh Dhoni presented Sachin Tendulkar with a cap, at the start of the day. He led the team out to the field with a huge crowd of fans cheering him and waiting to see him bat, though India opted to field first against the West Indies. >> After bundling out West Indies for 182, thanks to five wicket haul from Pragyan Ojha, the home team is at 157 for 2 at the end of the first day. Tendulkar 38* and Cheteshwar Pujara 34* were at the crease at the end of the day. >> Sachin mania might reach a mind-boggling crescendo in the second day and fans across the world hope for a spectacular performance from the Master which they could see no more.